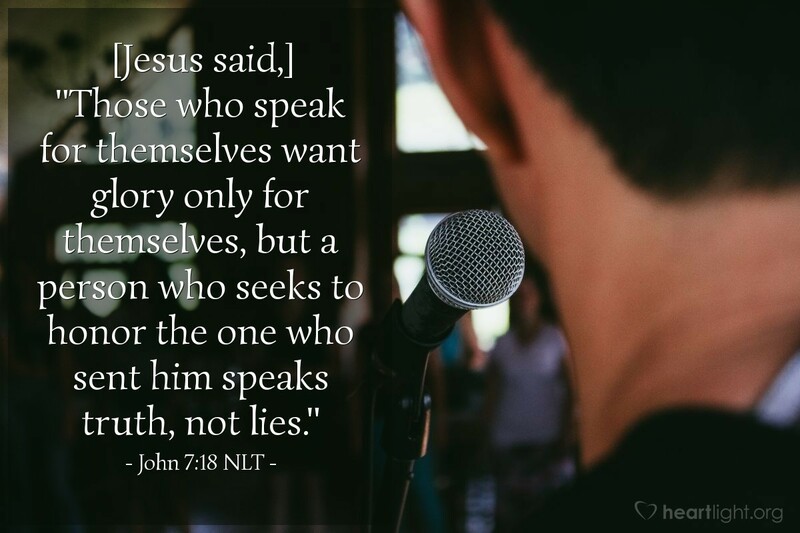 [Jesus said,] "Those who speak for themselves want glory only for themselves, but a person who seeks to honor the one who sent him speaks truth, not lies." What's your motive for pursuing Jesus? Why would you want to share your faith with a friend? Why would you speak to someone else about your Christian values? Jesus reminds us that the motivation of God's messenger is to honor the Father. So let's ask ourselves if what we say, teach, explain, expound, or suggest brings honor to God, or only to ourselves. Father, may the words of my mouth and the meditations of heart and the motives for my speech be pleasing to you and bring you glory. In Jesus' name, I pray. Amen.